Learn why training your dog – or cat – is so important. Make a happy, peaceful home. Life is easier with a trained pet. You can invite guests over without the risk of injury or embarrassment. You can enjoy walks without your arm being ripped off. You can buy nice shoes again. Make a happy, peaceful pet. Training helps pets and humans effectively communicate with each other, leading to less frustration by all. Dog and cat training also helps establish routine and teaches your pet what to expect, which eases anxiety. Strengthen your bond. Training time is great for having fun and bonding with your pet. Heart eyes all around. Obedience training is especially important for our petite pooches. Because of their size, small dogs sometimes feel threatened and can behave aggressively. Teach them early that this behavior is not ok. Also, many people bring their small dogs along with them – to restaurants, on vacations, wherever they’re allowed. Teaching them to be good canine citizens and polite in public allows your dog to experience new places and activities that can enrich his life. Use positive reinforcement with tiny treats. Your dog or cat should be rewarded every time he or she accomplishes a requested task. This can add up to a lot of treats in that tiny tummy! Very small, low-calorie treats, like Tiki Dog™ Aloha Petites™ Air-Dried Morsels, make perfect, healthy rewards. Keep sessions short and fun. Stop as soon as your pet seems bored or uninterested. Afterward, reward them with play time or a walk, lots of affection, and more treats – like Tiki Cat® Stix™! Be consistent. Don’t want your dog sleeping in your bed? Don’t let him, ever. Even if that means getting up out of your warm, cozy bed to move him. Groan. Be careful not to reward unwanted behavior. If your cat jumps up on your kitchen counter, don’t move her to the floor and then give her a treat. She might think that getting on the counter leads to a treat! Instead, catch her before she jumps up, and give her a treat as she stays put on the floor. Consider squatting, sitting or placing your small dog or cat on a raised surface during training sessions to reduce strain on your back and minimize your pet’s feeling of intimidation. Pay close attention to your pet’s cues. For example, when housetraining your dog, look for signs he has to “go” soon after meals and drinking water. Don’t force it. Like the last thing on your to-do list, sometimes it’s just not going to happen. 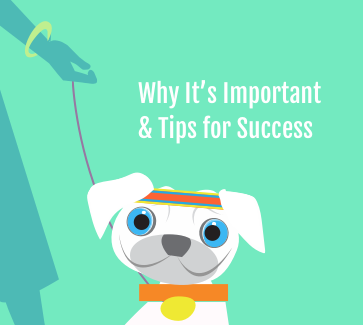 Be willing to accept that your pet may not achieve all of your goals. Lastly, have fun! If you exude happiness and a positive attitude, your pet will catch on and associate training as a good thing. Enjoy it!